The first few years of my life were spent in Cheyenne, Wyoming after being born in North Platte, Nebraska. When I was 10 years old we moved to Argentina where we lived for 2 � years. While we were there my mom took portrait lessons, in oil, from an old master. I was the model. That is really the only remembrance I have of my mom painting while I was small. In 1972 my family moved to Pierre, South Dakota and purchased a small amount of land where we raised several horses. 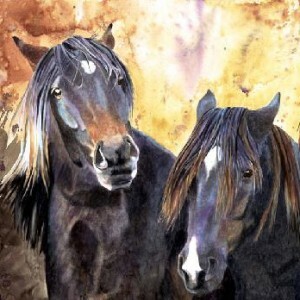 Although I did not draw them at that time, I truly loved being around the horses, the hay, the barn, and the cats. For several years I worked in pencil and color pencil drawing many, many ducks and geese which made their home or migrated through that area. I was a teenager when I made my first sale, a pen and ink of a zebra, and one of my teachers bought it. That was very exciting! I exhibited in a couple of very small art shows with my mom before I went off to college. In 1982 I married my sweetheart Jim Sigle who has since been very supportive of my art career. We have three wonderful grown children, all of whom are quite artistic in their own right. A few years later my mom took a watercolor class and fell in love with the medium. She strongly urged me to try it and so one day we sat side by side and she gave me a simple watercolor lesson. We lived a few hours away from each other, so with that small lesson I took what I learned and invested many hours practicing. After a considerable struggle and several discarded paintings later, I was producing some keepers. I also went through a period of time drawing portraits in pencil. I have drawn hundreds of faces so I feel I know the human face quite well. Once, when I had an order for a 50th Wedding Anniversary gift, I had been working on the drawing for quite awhile and it was almost complete. I went to the basement to change a load of laundry and when I came back to the drawing, there was a small orange hand print in the middle of the ladies face. My 1 1/2 year old daughter had innocently wanted to see what I had been working on and unfortunately had been eating m&m�s. I should have saved the drawing to show her years later, but instead my husband took very fine sand paper and was able to completely get rid of the orange. I then redrew the face since they were coming to pick it up the next day. My show schedule currently takes me places like Las Vegas; Great Falls, Mt. ; Jackson Hole, Wy. ; and the Denver area to name a few. I attend around 8-10 art shows a year. I also contribute to benefit auctions and work with a few galleries. Another enjoyable part of my career is gathering reference material from working ranches or wildlife areas since I want to capture the authentic western way of life, to paint and portray the real thing. I am a signature member of the Northern Plains Watercolor Society and a signature member of The Artists of the Black Hills. Currently I paint everyday. On this page are items 1 to 8 of 18 items.